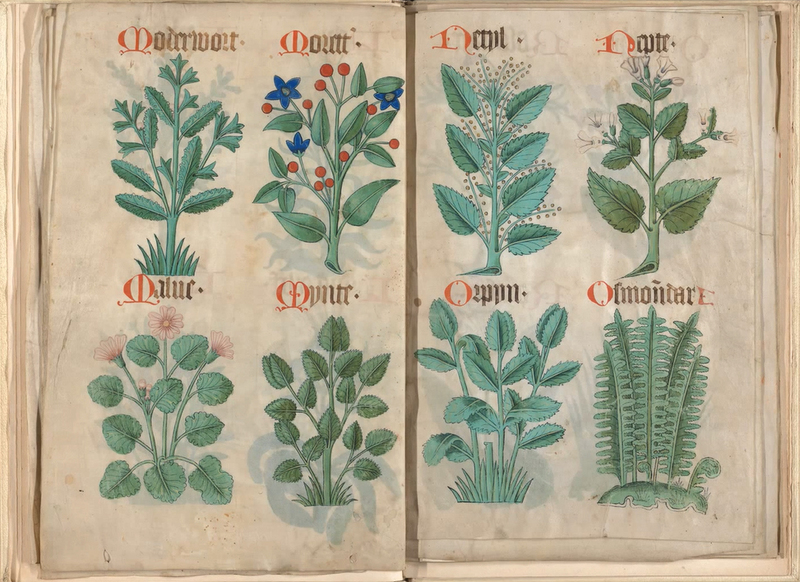 Stylized floral designs from MS. Ashmole's Tudor Pattern Book, circa 1504. I stumbled upon the stylized florals of the Tudor Pattern Book while "Pinning" botanical illustrations, and I was immediately enchanted. Seeing them and knowing that these elements had been recorded to be used as reference for the application of designs across all manner of forms felt like unlocking part of a code—a surface designer's language. 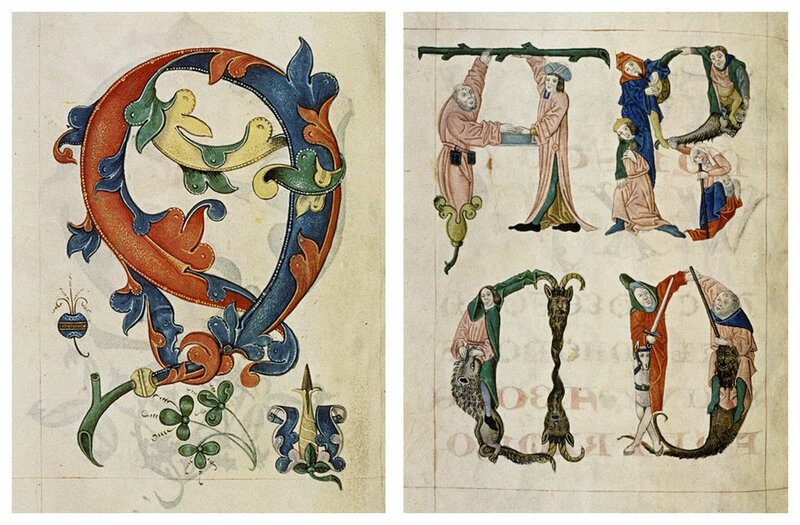 A stylized motif featuring trefoils and an alphabet formed from figures, both from the Tudor Pattern Book. Historic sources that were made and used specifically as reference material are so exciting for this reason—their influence can be seen and felt, both quite directly and hardly perceptibly, in reaches hard to fully comprehend. In researching the Tudor Pattern Book I found that there are two such works from roughly the same time period of 1520, the Tudor Pattern Book, attributed to MS. Ashmole, and the slightly earlier Helmingham Herbal and Bestiary. The Helmingham volume, to my delight, is housed in New Haven's own Yale Center for British Art—I will be making a trip to the reference library to see it soon! 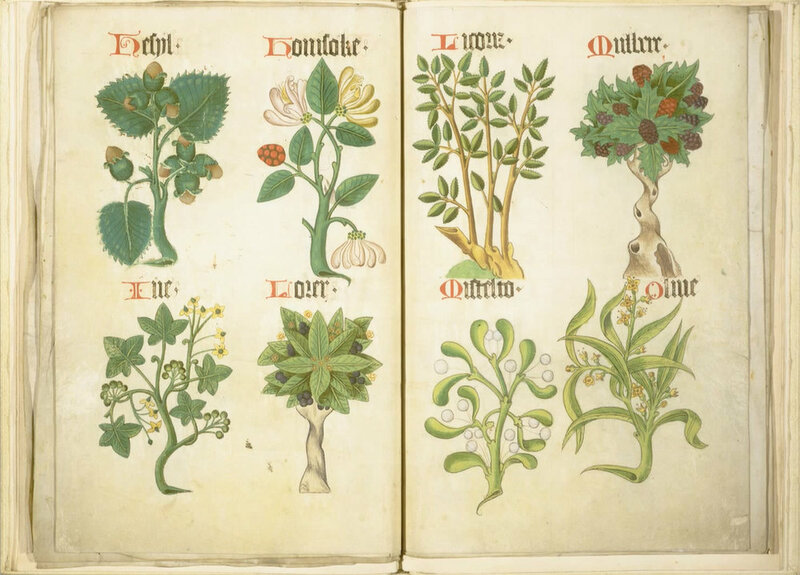 A page from the Helmingham Herbal and Bestiary, depicting Hazel, Honeysuckle, Ivy, Laurel, Licorice, Mulberry, Mistletoe, and Olive. Although the purpose behind these books is not entirely known, it is clear that they were intended to both record and disseminate a standardized version of collective knowledge. It is speculated that they may have been children's primers or merely records of useful information, particularly the herbal sections. However, the stylizing and reference to pattern does seem to point to the works being used, as stated by the Yale Center for British Art, as "models or patterns for all sorts of decorative work, from woodwork & paneling, to embroidery, tapestry, stained glass, or painted ceiling decorations." It is no surprise, then, to read YCBA founder Paul Mellon's words: "[it is] as though there were a mysterious aesthetic kinship between these 15th century artists and designers and our own present day artists." Though he did say this in the the 1960s, the legacy of such important sources is ever present. Helmingham's Olive, Pine (though the text says 'Pineapple'), Peach, Rosebush, Alder, Ash, Aspen, and Almond. Ashmole's version of Alder and Ash, which, as you can see, follows Helmingham's quite closely. 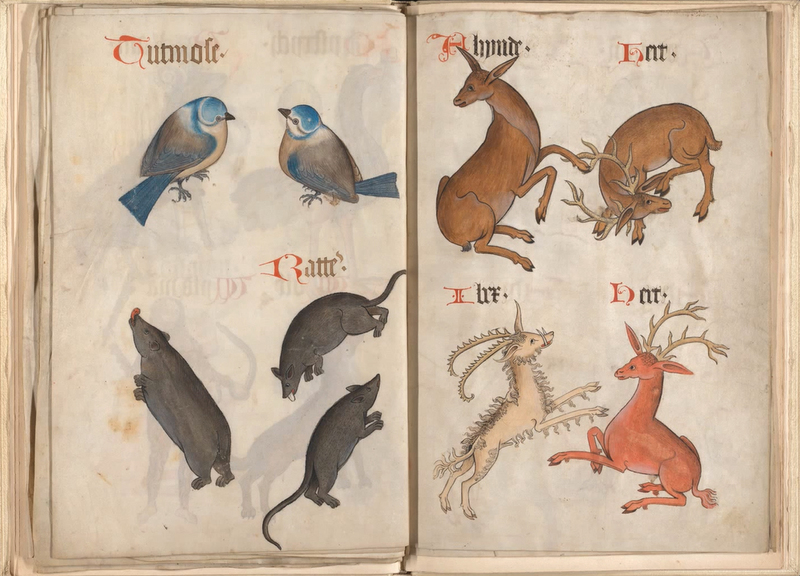 A page from the Helmingham Herbal and Bestiary, depicting the Titmouse bird, Rats, and creatures of the deer family, including an Ibex. Another page from the bestiary section of Helmingham's volume, showing, among others, a Lion and a Leopard at the top left. All of the following botanical images are from Ashmole's volume, and as you can see, many include odd little illustrations of other everyday scenes and objects that could also be used for useful reference or purely for decoration. On the right are pea and rose plants. Two more pages of botanical illustration. On the far left, Daffodil, and on the right, Blackberry and Birch. Finally, a page of bestiary from the Tudor Pattern Book, showing Reindeer and a Panther, clearly drawn from lore rather than observation. Bleed-through from the reverse page's illustration of a peacock can be seen behind the Panther.